The issue of Catalonia’s independence from Spain appears to be dividing the country’s labour movement, both nationwide and at the regional level in Catalonia, with the country’s two largest trade union federations reportedly losing members who see their unions as becoming either too accommodating to the Catalan independence movement or not supportive enough. The Catalan regional branches of the national CCOO and UGT trade union federations supported a march Sunday that brought an estimated 315,000 pro-independence supporters onto the streets of Barcelona, protesting against the preventive imprisonment of former government leaders and activists on charges of rebellion, sedition and embezzlement of public funds related to event’s surrounding last October’s illegal independence referendum. In October, the regional CCOO and UGT likewise supported a one-hour work stoppage in Catalonia to protest the violence surrounding the referendum, but did not join a “general strike” called by the radical pro-independence Intersindical-CSC union. Since then, the polarization of the political situation in Catalonia has seen both federations losing membership, both among those who think their support of independence is lukewarm and those who are opposed to independence and are upset over what they see as the CCOO and UGT lending tacit support to the independentista cause. Apparently confirming a downward trend in membership numbers already seen by union leaders late last year, the latest workplace elections for union representation in Barcelona are showing a trend in votes away from the CCOO and UGT and toward either the pro-independence Intersindical-CSC or the regional section of the national CSIF labour federation. The division is also marked by institutional rifts within the federations’ sections in Catalonia, with the UGT section representing Renfe railroad workers in Catalonia breaking with the regional leadership and refusing to participate in Sunday’s march. 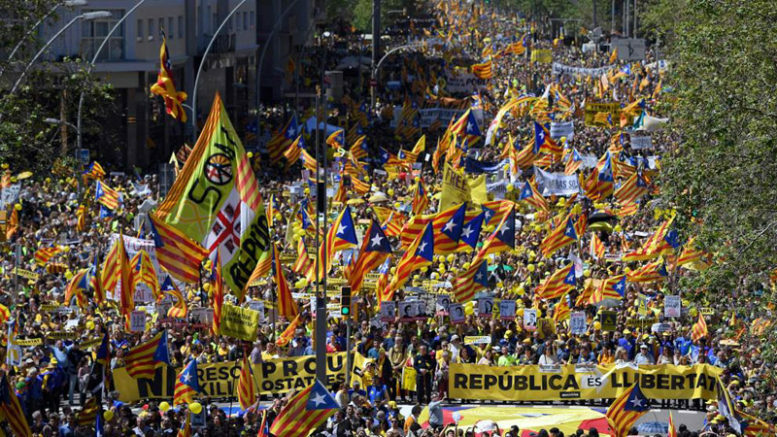 At the same time, UGT and CCOO section and regional leadership in other parts of Spain, where support for Catalan independence is either minimal or opposition manifests itself in outright hostility, have begun to express dissatisfaction with the national leadership of the federations for allowing the organizations in Catalonia to show solidarity with the pro-independence movement. The problem facing both the CCOO and UGT is that the much smaller Intersindical-CSC, radically pro-independence and led by a one-time member of the Exèrcit Popular Català (EPOCA, Catalan People’s Army) and the Terra Lliure (Free Homeland) armed separatist movements of the late-1970s, is now aggressively recruting Catalan union members, openly pitching itself as the logical substitute for the CCOO and UGT among the pro-independence workforce. Faced with a loss of membership to Indersindical-CSC and to the anarcho-syndicalist CGT and CNT labour unions, moves by the CCOO and UGT regional leadership to placate pro-independence union members appear to be alienating others who oppose independence, causing them to vote to switch affiliation to the centrist CSIF, known for its unwillingness to politicize labour issues and a strict adherence to worker representation solely on the issues of wages, benefits and workplace conditions.